Born and grown in Italy listening to American and British music John is completely soaked in American culture. Later on he learns how to appreciate Italian traditional music and he starts to mix them together. In the 90s John releases two L.P.s and tours north Italy with his band. In mid-90s he spends a few months in the States teaching music at the Ma-kee-ya summer camp on the Bear Mountains. At the weekend he’s always in NYC playing gigs in clubs of the Greenwich Village. He goes back to Italy and works for Warner bros. as a songwriter, the singer Zucchero asked one of his songs for his own Greatest hits. Then, John moves to London for three years and plays in many clubs of the city and keeps on writing songs. In the early 2000s John goes back to Italy and since then he has releases 5 more CDs and tours throughout Italy and occasionally in London. John continues playing concerts and opened for several important Bands such as Jefferson Starship, Southside Johnny, The Commitments, ecc. 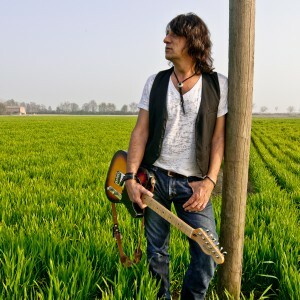 He’s good friend with American rockers as Willie Nile, Garland Jeffreys, James Maddock, Jono Manson, Carrie Rodriguez, Tao Seeger, Alejandro Escovedo, and he’s joined them as a guest on stage many times on their Italian tours. Last June, John has released his 7th CD: Meticcio and in 2015 John will release a new album in English with many of the above mentioned American artists as guests. He’s been invited to play at the Light of Day in Asbury Park and he’s playing the Stone Pony on the January the 16th and 17th 2015.